Please join us, Thursday, November 8th, 2007, starting at 8am and continuing all day, as 2 modular homes will be placed on foundations at 522 and 524 Thomas Street in Covington's Austinburg neighborhood. We will have a brief program at 9am to celebrate this great day. - The Vineyard: 1,600 SF 2-story w/ front porch. 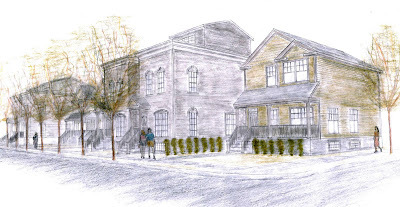 - The Rowhouse: 1,700 SF 3-story w/ 3 decks. What makes Seneca Place so exciting is that it is the first new construction in the neighborhood in decades. Seneca Place is part of a larger revitalization initiative in Austinburg to help improve the lives of residents and to promote homeownership. The house-setting event will be weather-permitting. In case of inclement weather, please contact Rachel Hastings at 859-866-7527.